The difference between animal offspring is fascinating. Some of them are able to walk within hours after being born (like giraffe’s calf ), and others need months before they get out of mama’s pouch and can be more or less independent (like little joeys for whom it takes 235 days to get grown enough). 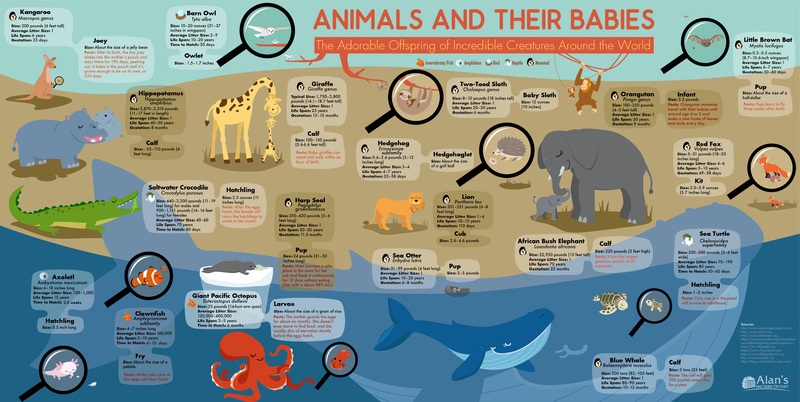 This infographic by AlansFactoryOutlet.com also shows some interesting physical facts and statistics of survival for certain species. And all the animals are shown using a size of an adult whale for scale.